Italian cuisine. Two words, and think about how many feelings, thoughts and memories are immediately evoked. Great bowls of pasta and salad served with friends and family, wonderful nights out at small restaurants, little glasses of red wine, and hours upon hours happily spent in the kitchen, working while great jazz is playing, making the food that seems to be so familiar to so many of us. Real Italian food is a genuine mis-match of ancient and very regional cuisines, that blended as Italy emerged from its unconnected system of city-states. Though small, Italy has enough natural barriers to create micro-climates, distinct growing climates and kept people in relative isolation for centuries. Think how isolated and different Sicily must have been from Rome, or the Alpine villages. During the height of the Roman empire, an incredible amount of culture was forced onto Italy. Persians brought their ingredients and influence as they made their way through the Mediterranean sea. The ancient Greek civilization was right in Italy’s back yard, and they had a great deal to do with the development of Italian cuisine. The African and European conquests brought back people and ingredients from all over. Even explorers to the Americas influenced Italy. Tomatoes were originally brought from the Americans and introduced to the Italians only a few centuries ago. Prior to that, many Italian sauces were pepper or broth based. The dry and warm climate was ideal for slow curing meats, yielding some of our favorite things, like Prosciutto. And of course, the wine, the olives, and the great cheeses… Food has always been paramount to the people of Italy, and their climate is perfect for embracing the craft. If anything unites Italy, it’s their unique and incredible food and wine. And you will notice, simple perfection is the key to most authentic Italian recipes. Pasta is another central figure in Italy’s cuisine. There is no ‘one’ type of pasta… there are thousands of varieties, each separate from the next. For example, take a basic pasta. How many shapes, thickness and different styles of pasta can you create? Fresh pasta, dry pasta. And then the ingredients that go into the pasta dough itself. In the ancient times, pasta dough was no more than flour and water worked and formed into threads or basic noodles (some say this was brought to Italy from Persia as well). Now, we usually use some sort of egg product. Some use white wine. Even the flours used will greatly differentiate the final product. It all comes down to your taste. What final product do you want? Every pasta dough is equally labor intensive to create, so if you’re going to put the work in, consider what you’re working for. This is where experience is crucial. Your Italian grandmother will tell you exactly what to put in your dough if she’s making raviolis. And guaranteed it will be different than that of papardelle. And different from linguine. Experience matters. In my opinion, pasta dough can be difficult to make and roll, and if it’s an across – the – board, user friendly recipe you’re looking for, than I have the answer. This pasta is can be characterized as ‘indestructible’, and can be made into almost any shape pasta you can dream. It rolls well, holds up to vigorous molding, and keeps excellent texture after having been boiled to al dente. I learned this a long time ago (maybe 8 years now) and it is still my go-to pasta dough. This is the dough in restaurant quantity, I would suggest scaling it in half. Place everything in a stand mixer fitting with the dough hook. Run machine on low until a dough forms. Turn dough out onto a well floured work surface and knead, by hand, until very firm and smooth. This is a lot of work, but take your time and resign yourself to it. It’s worth it. Wrap dough tightly in plastic wrap and refrigerate for one hour. This allows the flour time to properly absorb the liquid (you can use a vacuum packager and the dough will be ready immediately). Cut dough into quarters. Work one quarter at a time, making sure to keep the other pieces well wrapped (otherwise a dry crust will form, and this will never go away). 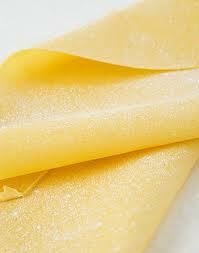 Using a pasta machine, roll dough to desired thickness, and cut into desired shape. It’s a lot of work, but it’s the best fresh pasta dough (best fresh pasta) I have ever had, and is worth every laborious second.